Here's my card for this month's Mix It Up challenge at SugarPea Designs. I combined the sketch with the confetti-like look of the sprinkles coating on the juicy strawberry in the inspiration photo to come up with this birthday design. My dotty paper comes from SPD's It's a Celebration paper pad. I cut it with the large journal card die from the Heart Journal Card die set, then matted the dotted piece on a bright pink scalloped panel cut with a die from the Birthday Journal Card dies set. The scalloped panel was layered on to a green panel that covers most of a darker green card base. I used a piece of the same light green cardstock and the Stitched Flags die set to cut the long stitched banner strip for the sentiment. 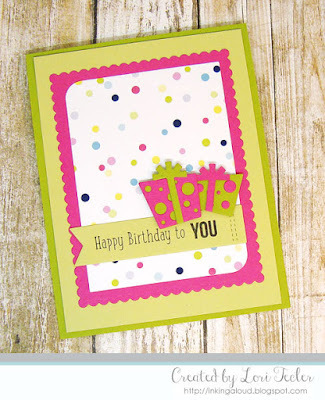 The "happy birthday to you" sentiment from the You stamp set was stamped on the strip in black ink. I added it to the panel, then accented it with a pair of gift boxes made with the Birthday Journal Card die set. Love the patterned paper and the bright happy colors! I love this! I instantly thought of that dotty paper too, but I'm all out :( I need more because it's so much fun! Thanks for joining in the SugarPea Designs Mix It Up Challenge this month! Oh so pretty and vibrant, Lori!! You are rocking the sketch and the inspiration! !